I am becoming increasingly aware that these posts are developing a somewhat narrow focus on the hoppier end of the Brazilian microbrew spectrum, and with that in mind I had planned to mix up the next few posts with a look at something completely different, like wheat beers. However, said plans were, like the warm dregs of a Skol can, quickly poured down the sink when it came to my attention that Cervejaria Colorado has started to brew an Imperial IPA, perhaps in response to the fine one already produced by their Ribeirão Preto rivals Cervejaria Invicta. Alas, on chancing upon this discovery it was very much inevitable that a trip would have to be made to the supermarket in order to secure this precious treasure. I’m afraid it also means that you’ll have to wait a little longer to read about wheat beers. Background: See review for Colorado Indica. So, how does the Vixnu compare to Colorado’s classic the Indica, and its direct rival, the Imperial IPA by Invicta? As with other Colorado beers, the first thing of note is Vixnu’s label, which is another gem from Randy Mosher. Whereas Mosher’s Indica was an image of the Taj Mahal with its pillars replaced with pint glasses, Vixnu’s depicts the Colorado bear as the Hindu god Vishnu (Vixnu in Portuguese) – the bear cunningly using his extra arms to hold more pints (if only life were so simple, dear readers!). Colorado’s use of Vishnu – the second god in the Hindu triumvirate, of whom the preserver and protector Vishnu returns to the earth in troubled times to restore the balance of good and evil – perhaps symbolises that Colorado want to promote Vixnu as their premium beer, the one all others should reverently kneel down to. I may, of course, just be reading a bit too much into things. As for the beer itself, I’ve already said that Colorado’s Indica is the Brazilian beer I most often go back to, whilst Invicita’s Imperial IPA is one of the tastiest. Vixnu then, had a bit of work to do. Like the Inidica, the Vixnu pours a lively and persistent creamy-coloured head, although with a slightly darker caramel colour. Once open you can immediately tell this is a strong hoppy beer – and that’s before you’ve even tasted it – because it exudes a rather potent and persistent aroma, of which citrus, fruits and hops are the dominant tangs. Frankly, I wouldn’t be surprised if you could get a little tipsy just by whiffing it for half an hour. Vixnu’s strength (9.5%) is confirmed by its taste, which is almost exactly like how it smells – intensely bitter, hoppy and with strong a citric, fruity zest. Despite its strength Vixnu is pretty well balanced, probably a little more so than the Invicta (although that still remains a very good beer). the book is on the table’s Verdict: Vixnu is a beast of a beer, and like the Hindu god it is named after, you should treat it with respect. Given its strength and intensity Vixnu is certainly not a session beer, and to gain the most satisfaction from it you should probably instead drink it in isolation – one one of those occasions where your motive for drinking is to enjoy quality as opposed to consume quantities. A bottle of Vixnu will take you a while to drink, but savour it because it is very good indeed. 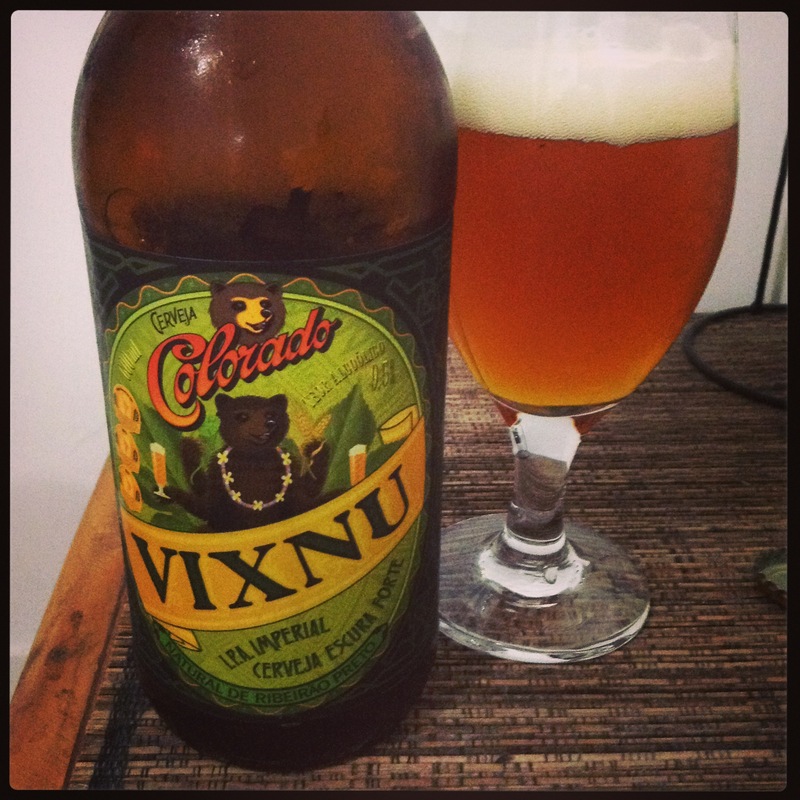 I’ve had Colorado Vixnu many times and I’m not so sure they use maracujá on it. Have you tried Maracujipa, by 2cabeças? I believe that’s the only true fruit american IPA in Brazil, with maracujá added. That’s what it says on the bottle so I’ll take it that it is true! Actually my bad, I read the label incorrectly. Amended! I need to find a local place that carries some of the beers you review. You always make me want to open a bottle! I live near Ann Arbor, Michigan, US, a cosmopolitan University town so chances are good. Can I learn about US distribution from the breweries? Yeah, I think the best bet would be to contact them individually. I’m not aware of a whole lot of microbreweries that export just yet, but I’m sure this is going to be something that changes in the next few years. I got turned on to the 3 Colorado beers that only recently began selling in Oklahoma at one of our nicer restaurants in Tulsa. It was amazing enough for me to seek it out at the liquor store. At the time, they only had 2 of the 3 and just got in Vixnu. Oklahoma is starting to experience a little of an explosion in craft beers, so I make it a point to support them. But, this has quickly become one that I have been buying regularly. I can only hope that this summer, I can have the occasion to find it on tap in Brazil during the World Cup.